In Part I of this text, the events which led up and set the backdrop for the present conflict in Libya were discussed. Part II examined the central role of media distortion and misinformation in justifying the NATO war on “humanitarian grounds”. The following text examines US-NATO war plans and intelligence operations pertaining to Libya, prior to the onset of the insurrection in Eastern Libya and the adoption of UN Security Council Resolution 1973. From the outset, the conflict in North Africa was intended to lead into an all out NATO war. The Pentagon and NATO are not only arming the Transitional Council in violation of international law, they also had forces on the ground from the start. U.N. Security Council Resolution 1973 only passed, because Moscow and Beijing abstained. This was a tactical move meant to limit the war. If the resolution had been vetoed by Russia and China, in all likelihood, the U.S., Britain, France, Italy (and the Western European members of NATO) would have resorted to “other means,” including an outright invasion. By abstaining and getting the NATO powers to vocally invest themselves to U.N. Resolution 1973 and to hide behind it, Moscow and Beijing managed to limit the options of the Pentagon and NATO. This is a casual omission that the U.S. had violated international law and was operating on the ground in Libya before any U.N. approval. Moreover, Italy had opened its military bases to use by the U.S., Britain, and France before any U.N. approval by repudiating its non-aggression pact with Libya on February 27, 2011. In other words, the war against Libya had already begun. These foreign forces in Libya were sent to prepare for the war by selecting targets to be bombed. Even before the attacks were launched, both Britain and France even announced plans in November 2010 for war games that envisioned attacking Libya under the exercise codename “SOUTHLAND.”  The British and French military assets being mobilized for these drills ended up being used to attack Libya. November 2010, according to the Italian journalist Franco Bechis of Italy’s Libero, also happened to be the time that Paris started planning for regime change in Libya. The Black Watch […] had been placed on heightened readiness, prepared to deploy to North Africa at 24 hours’ notice. Under a humanitarian pretext, London has also sent military advisors to the Transitional Council. The British press reported about this in early-March 2011: “Britain is also preparing to send diplomats and specialist advisers to the eastern city of Benghazi, where the disparate Libyan opposition is based.”  At least one of these so-called “special advisors” was later apprehended near in the vicinity of Benghazi. In reality, London blatantly lied about sending a British diplomat and his plain clothed security to Benghazi. In this case, the plain clothed security guards were undercover British commandos. The British group was arrested by rebel forces when the security team lied about not being armed. Hidden weapons and a cache of explosives were found on them. Why was the so-called British diplomat and his security team not directly flown into Benghazi? At about the same time, three Dutch Marines were also caught by Libyan forces operating inside Sirte. The Dutch government insisted that the Dutch troops were merely evacuating two Dutch workers. The French also sent planeloads of what was reported to be medical aid to Benghazi. In turn, Pakistani sources reported in late February that the U.S., Britain, and France had sent military advisors to Benghazi. What these reports confirm is that there was a foreign military and intelligence presence in Libya before any U.N. mandate for a no-fly zone was granted. In this regard, the governments involved were in blatant violation of international law. Foreign intervention also consisted in embedding U.S., British and Saudi “intelligence assets” inside Libya. The latter consisted of Islamic para-militaries from Afghanistan and other conflict zones, which were dispatched to Libya. These intelligence assets are what the U.S. and its allies would themselves define as “terrorist elements.” This is utter hypocrisy. Acknowledged by numerous reports, the U.S. and its allies are in bed with their own so-called terrorist enemies. This should come as no surprise. Washington and its allies have created, controlled, nurtured, and unleashed extremist and criminal fighting groups in Afghanistan, Bosnia-Herzegovina, the Caucasus, Iraq, Syria, Iran, and Lebanon. Two former Afghan Mujahedeen and a six-year detainee at Guantanamo Bay have stepped to the fore of this city’s military campaign, training new recruits for the front and to protect the city from infiltrators loyal to Col. Moammar Gadhafi. All the so-called debate within NATO and lack of enthusiasm about the alliance’s role in Libya was mere bravado and a theatrical act for the public. Gradually NATO would be presented as being involved only through a “technical role” in the war. It is at this point the U.S. Defence Secretary, Roberts Gates, declared: “This isn’t a NATO mission. 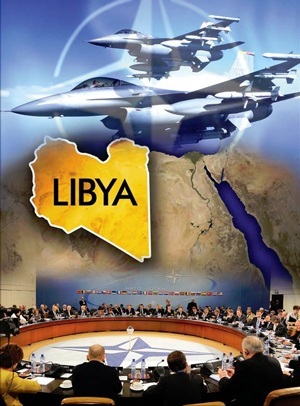 This is a mission in which NATO machinery may be used for command and control [against Libya].”  In reality, the project was a NATO project from the onset of the mobilization of the military forces encircling Libya. NATO was also monitoring Libyan airspace before Libya was attacked. In the frankest of terms Secretary-General Anders Fogh Rasmussen, the Obama Administration, 10 Downing Street, and the E.U. were misleading the public. It is also worth noting that Anders Fogh Rasmussen was selected to be the secretary-general of NATO as a reward for his support as Danish prime minister for the wars in Afghanistan and Iraq. Why has Operation Odyssey Dawn been Handed to NATO? NATO is an undemocratic body and is not answerable to any constituency of voters. It is through NATO and international organizations that the voting public is being bypassed. The command of the war against Libya has deliberately been reassigned from the Pentagon to NATO as a clever means to bypass public scrutiny and accountability by the U.S. government and all other governments involved in this war. Even the so-called NATO holdouts, Germany and Turkey, are supportive of this war. Berlin is sending more military resources to NATO-garrisoned Afghanistan so that the military forces of its allies can be freed up to attack Libya. Moreover, it is a U.S. flag officer that holds the post of Supreme Allied Commander Europe. U.S. Admiral James G. Stravridis is the supreme commander of NATO military operations. Admiral Stravridis does not need to have the approval of anyone in NATO for many of the combat decisions he makes. As a matter of public record, this was deliberately clarified by Senator Joseph Lieberman and Admiral Stravridis at the U.S. Senate Armed Services Committee hearing where Libya and U.S. military operations in Europe were discussed. It should also be noted, while Admiral Stravridis can operationally work independently from the oversight of the rest of NATO’s members, he is totally subordinate to the Obama Administration and the Pentagon. Ankara has been portrayed as siding with the Libyan regime. In reality Ankara supports the Transitional Council and the NATO war against Libya. It has been claimed that Turkey has been advising Colonel Qaddafi and his regime, but this is misleading. Ankara has been playing the role of a negotiator and go-between, but it is not impartial. Turkey is administering or running the airport in Benghazi from which the U.S., British, French, NATO, and Qatar have given covert and illegal combat support assistance to the Transitional Council. It was actually NATO that assigned Ankara the airport authority role via a NATO agreement with the Transitional Council. Moreover, one of NATO’s operational headquarters for the war against Libya is located in Turkey and Ankara’s naval forces are participating in the naval operations and embargo against Libya. Turkey is also a de facto combatant through its combat support role in the war. NATO works on a consensus basis and if countries like Turkey and Germany were really against the war then they could have blocked NATO from getting involved in Libya. NATO as a whole is a military combatant in Libya and therefore all NATO members are by extension to be considered combatants. When General Carter Ham was asked by Senator Sessions if Turkey was obstructing the military campaign or blocking NATO attacks as was being claimed, he confirmed that Turkey was supportive of the war. General Ham is the commander of U.S. Africa Command (AFRICOM) and the military flag officer that originally led the war against Libya until operations were transferred over to NATO. Before the NATO campaign against Libya, Ankara had been deepening its tied with Tripoli and had worked to establish a free-trade agreement between Turkey and Libya. Like its ties to Libya, the Turkish government has also been deepening its ties with Iran, Syria, Lebanon, Palestine (Hamas), Russia, and several former Soviet republics. This has been presented as part of the renaissance in Turkish foreign policy, which sometimes is labelled as neo-Ottomanism. This, however, appears to also be a means of bringing these players into the orbit of Washington and the European Union. In this regards Turkey could be seen as working as a Trojan horse that is integrating these players into the imperial network of Washington’s empire. Turkey’s role in Syria, Lebanon, and Gaza also appear to be part of a coordinated effort to cut them off from Iran. The U.S. and its allies have breached international law and U.N. Resolutions 1970 and 1973 by sending weapons to the Transitional Council. U.N. Resolution 1970 specifically states that no weapons are to be shipped into Libya. Qatar’s Prime Minister Al-Thani even said that the rebels will be armed at the start of the conflict. Prime Minister Al-Thani did not make these statements in isolation; he made these statements during the London Conference on Libya and in conjunction with his meetings with the U.S., the E.U., and NATO. Days later, General Abdel Fattah Al-Yunis (Al-Younis) and the Transitional Council told the Saudi-owned Al Arabiya Network that they had taken delivery of weapons which had been shipped into Libya from abroad. A few days later, the Emir of Qatar, Sheikh Hamad bin Khalifa Al-Thani, told CNN that Qatar was delivering weapons to the Transitional Council in Benghazi. Afterwards Qatar’s Al Jazeera went on the offensive to shield Emir Al-Thani and legitimize his actions. The U.S. position became public at the same time that news broke out that the CIA was going to arm the Transitional Council. The Washington Post was told by an unnamed U.S. official on March 30, 2011 that “President Obama has issued a secret finding that would authorize the CIA to carry out a clandestine effort to provide arms and other support to the Libyan opposition groups.”  Moreover, it would become public that Washington was sending arms into Libya through its Arab clients. “We know the Egyptian military council is helping us, but they can’t be so visible,” said Hani Souflakis, a Libyan businessman in Cairo who has been acting as a rebel liaison with the Egyptian government since the uprising began, according to the newspaper. More Double-Standards: Who is Sending Mercenaries into Libya? The British plan would see Qatar and Emirati troops land in Benghazi or alternatively the hiring of former members of the British military as private military contractors. The latter are not only mercenaries, they are also British soldiers that are given special leave from military service to fight in an unofficial capacity. Western military chiefs are looking at the example of Afghanistan’s Northern Alliance, who in 2001 helped oust the Taliban, with support and leadership from CIA military teams and British Special Forces. Another example [is] the 1990s Balkan wars, when a US mercenary company trained and led the Croatian army to significant victories over Serbian forces in an intervention quietly backed by Washington. However, it is believed that former British personnel could be used as trainers and “force multipliers”. Former members of the Special Air Service, Special Boat Serve and other elite British regiments are frequently employed by private military companies and Middle Eastern regimes as “advisers” for their own armed forces. For operations where the British Government is not officially involved, Special Forces personnel are often allowed to temporarily resign or take leave in order to fight for others. In the 1970s, former members of the SAS fought for the Sultan of Oman with Britain’s tacit support. Many of the SAS soldiers were allowed to temporarily resign from the British Army for the Oman campaign, then returned to service afterwards. Yet, before the British government even put forward such a plan there were reports that London, alongside Qatar, Egypt, Saudi Arabia, and the U.S., was arming the Transitional Council’s fighters against the Libyan military. This would have to include training by foreign contractors or military forces. Phase Two of Operation Libya: Direct Ground Intervention? The role of NATO and the military coalition against Libya is not limited to the air and the sea. During a U.S. Senate Armed Services Committee hearing, Admiral Stravridis was obliged by Senator John McCain into acknowledging that NATO forces would eventually move into Tripoli. Oana Lungescu, the spokeswoman for NATO, has denied that NATO plans on sending boots on the ground to Libya, but this stands in stark contradiction to operational command statements. McCain has repeatedly demanded that Libya’s neighbours and NATO fund the war against Libya too. Alongside Senator Lieberman, McCain had repeatedly called for the arming of the Benghazi-based forces from the start of the conflict. Both McCain and Lieberman started making these demands and calling for a no-fly zone while visiting Israel and consulting with Israeli leaders. Both want a invasion of Libya. In other words, an international force will be sent for so-called “peacekeeping” or “stabilization” missions similar to those in the former Yugoslavia and Afghanistan. This is another shape and name for occupation. The Pentagon and NATO are now looking at methods to publicly side-step the U.N. in order to invade Libya. Both Cairo and Tunis are slated to play a role in a NATO-sponsored ground invasion. In early-March 2011, Hillary Clinton held consultations in Tunisia and Egypt with the Libyan opposition and the governments in Egypt and Tunisia. She was actually coordinating for the war on Libya with Tunisia and Egypt. A foreign troop presence, specifically under the E.U. and NATO, would be geared towards dividing Libya into a loosely-knit protectorate or trusteeships. This would probably take shape under two separate administrations respectively based in Tripoli and Benghazi. If the occupation were to occur it would also be agreed upon by at least one or both of the governments of a divided Libya with capitals respectively in Tripoli and Benghazi. President Obama and his allies initially said that the war was not about regime change, but they have backtracked. All the hallmarks of deceit are present. The unstated goals in Libya have always been the same, but like in Iraq the goals stated publicly have changed. Obama, President Sarkozy, and Prime Minister Cameron have now admitted in a joint letter that the mission in Libya is not over until Qaddafi is removed. This means regime change. It can also be part of a strategy to get Qaddafi to agree to the partition Libya to save himself and his regime. Moving forward, Senator John McCain and Admiral Stravridis have stated that a strategic stalemate between Qaddafi and the Transitional Council in Libya is unacceptable for Washington or to the interests of the U.S. while also ironically and unwittingly mentioning that no-fly zones and U.N. sanctions “don’t succeed.”  If the no-fly zones and U.N. sanctions do not work in protecting civilians, then why were they imposed on Libya in the first place? The no-fly zones and sanctions imposed on Libya are not intended to protect civilians or to stop the internal fighting, but are intended for weakening the defences of Libya. The European Union has also made the preparations for deploying an E.U. military force to Libya called EUFOR Libya. The German government has been a major, but subtle, backer of this. This is being presented under the guise of a peacekeeping mission in Libya. This is essentially the same thing as using NATO peacekeepers, but under a different name. NATO is moving into fill the so-called “post-conflict” voids in places that the Pentagon and its cohorts wage war. This has happened from the former Yugoslavia to Afghanistan and Lebanon. It is a new strategy of modern-day colonization. The use of NATO can happen formally or informally. In Lebanon, NATO wanted to send troops, but when alarm bells began to ring amongst the Lebanese and Arab peoples the name of NATO was formally removed. Instead NATO members did send their troops to Lebanon, but not under the name of NATO. The operation became informal. The role of NATO in Lebanon was not drawn in the spirit of peacekeeping. In fact, General Alain Pellegrini the former military commander of the United Nations Interim Force in Lebanon (UNIFIL) in an interview with the Lebanese newspaper As-Safir confirmed that the Pentagon had planned to launch a NATO invasion of Lebanon to help Israel and to use NATO in occupying Lebanon in 2006. Over a month after his claims about Qaddafi’s attempts to use chemical weapons on civilians, General Abdul Fatah Al-Yunis also said that NATO has been slow to act in support of the Benghazi-based Transitional Council. His previous statement about chemical weapons aimed at bolstering support for foreign military intervention is an outright lie. His latest statement, however, could either be a coordinated propaganda effort aimed at shoring up demands for more NATO military intervention or a genuine sign that NATO has deliberately been using measured responses to get the Transitional Council to become more dependent on foreign support and to prolong the internal fighting in Libya. It may be both. “Unfortunately, and I am sorry to say this, NATO has disappointed us. My staff have been in contact with NATO officials to direct them to targets that should protect civilians, but until now, NATO has not given us what we need,” he said. “Civilians are dying daily because of lack of food or milk, even children are dying. Even by bombing. If NATO waits for another week, it will be a crime that NATO will have to carry. What is NATO doing? It is shelling some defined areas only,” he said. General Al-Yunis also stated: “If NATO wanted to remove the siege on Misurata, they would have done so days ago [during their attacks on the Libyan military. ]”  In this regard, Al-Yunis is corrected. The U.S. and NATO are deliberately prolonging the war and for the time being are trying to keep a strategic stalemate in Libya as part of their effort to control the entire country. This has been part of their longstanding plans to weaken Libya either through partition or soft balkanization under a new federal system. Mahdi Darius Nazemroaya specializes in the Middle East and Central Asia. He is a Research Associate of the Centre for Research on Globalization (CRG). 1 Ken Dilanian, “CIA officers in Libya re aiding rebels, U.S. officials say,” Chicago Tribune, March 30, 2011. 3 Nicolas Squires, “Libya: Italy repudiates friendship treaty, paving way for future military action,” The Daily Telegraph (U.K.), February 28, 2011. 4 Mark Hosenball, U.S. agents were in Libya before secret Obama order,” Reuters, March 31, 2011. 7 Michel Chossudovsky, “When War Games Go Live: ‘Staging’ a ‘Humanitarian War’ against ‘SOUTHLAND,’” Global Research, April 16, 2011. 8 Air Defence and Air Operation Command, Southern Mistral 11: Assets Deployed, February 15, 2011: <http://www.southern-mistral.cdaoa.fr/GB/index.php?option=com_content&view=article&id=38&Itemid=104>. 10 James Kirkup and Richard Spencer, “Libya: British Army ready for mission at 24 hours’ notice,” The Daily Telegraph (U.K.), March 4, 2011. 12 Martin Chulov, Polly Curtis and Amy Fallon, “‘SAS unit’ captured in Libya.” The Guardian (U.K.), March 6, 2011. 13 Caroline Gammell, Nick Meo, and James Kirkup, “Libya: SAS mission that began and ended in error,” The Daily Telegraph (U.K.) March 6, 2011. 15 Michael Georgy and Maria Golovina, “Libya to hand over captured Dutch marines – Gaddafi son,” Reuters, ed. Philippa Fletcher, March 10, 2011; Associated Press (AP), “Gaddafi’s forces capture Dutch marines on rescue mission,” March 3, 2011. 18 Steven Erlanger, “French Aid Bolsters Libyan Revolt,” The New York Times, February 28, 2011. 19 Akhtar Jamal, “US, UK, French forces land in Libya,” Pakistan Observer, February 28, 2011. 20 Charles Levinson, Ex-Mujahedeen Help Lead Libyan Rebels, The Wall Street Journal (WSJ), April 2, 2011. 21 Joseph Felter and Brian Fishman, Al-Qa’ida’s Foreign Fighters in Iraq: A First Look at the Sinjar Records (West Point, N.Y.: West Point U.S. Military Academy, 2007), pp.7-12. 24 David Brunnstrom, “NATO meets to decide alliance in Libya,” Reuters, March 23, 2011. 25 David Brunnstrom et al., “NATO to enforce Libya embargo, stuck on no-fly,” Reuters, ed. Paul Taylor, March 22, 2011. 26 Jamey Keaten and Slobodan Lekic, “World Leaders Meet in Paris for Critical Libya Talks,” Associated Press (AP) March 19, 2011. 27 Barack Hussein Obama, Remarks of the President in Address to the Nation on Libya (Address, National Defense University, Washington, D.C.: March 28, 2011). 28 Terri Judd, “French jets enforce no-fly zone as America plays done its role,” The Independent (U.K.), March 21, 2011. 29 Omar Karmi, “US deploys naval and air forces near Libya,” The National (U.A.E. ), March 1, 2011; Ian Black et al., “Libya crisis: Britain, France and US prepare for air strikes against Gaddafi,” The Guardian (U.K.), March 17, 2011. 30 United States Senate Armed Services Committee, U.S. European Command and U.S. Strategic Command in review of the Defense Authorization Request for Fiscal Year 2012 and the Future Years Defense Program, 112th Congress, 2011, 1st Session, 29 March 2011. 31 Today’s Zaman, “Turkey will run Benghazi airport,” March 29, 2011. 33 U.S. Senate Armed Services Committee, Testimony on U.S. Transportation Command and U.S. Africa Command in review of the Defense Authorization Request for Fiscal Year 2012 and the Future Years Defense Program, 112th Congress, 2011, 1st Session, 7 April 2011. 34 David Stringer, “Top envoys agree Libya’s Moammar Gadhafi must step down but don’t discuss arming rebels,” Associated Press (AP), March 29, 2011. 35 Rod Nordland, “Libyan Rebels Say They’re Being Sent Weapons,” The New York Times, April 16, 2011. 37 Anders Fogh Rasmussen, “Battle for Libya,” interview by Ghida Fakhry, Al Jazeera, April 8, 2011. 42 Mahdi Darius Nazemroaya “‘Operation Libya’ – Recognizing the Opposition Government Constitutes a Pretext for Military Intervention,” Global Research, March 13, 2011. 43 Nigel Morris and Oliver Wright, “Clinton: UN resolution gives us authority to arm Libyan rebels,” The Independent (U.K.), March 30, 2011. 44 Julian Borger and Ewen MacAskill, “No-fly zone plan goes nowhere as US, Russia and Nato urge caution,” The Guardian (U.K.), March 1, 2011. 45 Stringer, “Top envoys agree,” Op. cit. 46 Dilanian, “CIA officers,” Op. cit. 47 Karen DeYoung and Greg Miller, “In Libya, CIA is gathering intelligence on rebels,” The Washington Post, March 30, 2011. 48 Giles Elgood, “Egypt arming Libyan rebels Wall Street Journal reports,” Reuters, ed. Andrew Roche, March 18, 2011. 50 Nordland, “Libyan Rebels,” Op. cit. ; the Emir of Qatar also confirms this by telling CNN’ Wolf Blitzer that there would be training programs for the arms being sent to the Transitional Council from outside Libya. 54 Jordan Times, “’Jordanian fighters protect aid mission,’” April 2, 2011. 57 Scott Peterson, “Italy rejects Qaddafi, recognizes Libyan rebel government,” Christian Science Monitor, April 4, 2011; Elgood, “Egypt arming Libyan,” Op. cit. 58 U.S. Senate Armed Services Committee, U.S. European Command, Op. cit. 59 U.S. Senate Armed Services Committee, U.S. Transportation Command, Op. cit. 60 Jackson Diehl, “McCain: U.S. ‘making up reasons’ to avoid action on Libya,” The Washington Post, March 1, 2011. 61 U.S. Senate Armed Services Committee, U.S. European Command, Op. cit. ; Admiral Stravridis also told the U.S. Armed Services Committee that they should realize that NATO has a tradition of stationing troops in the former Yugoslavia and Afghanistan as a precedent for Libya. 62 Nicole Gaoutte and Viola Ginger, “Clinton will Travel to Egypt, Tunisia, Meet With Libyan Opposition Leaders,” Bloomberg, March 10, 2011. 64 Nigel Morris, “British troops could be deployed to Tunisia,” The Independent (U.K.), April 28, 2011. 66 U.S. Senate Armed Services Committee, U.S. Transportation Command, Op. cit. 67 Mark Kennedy, “Canada joins UN coalition aerial mission on Libya,” Edmonton Journal, March 19, 2011; Agence-France Presse (AFP), “Canada wants Kadhafi out but will keep to UN mandate,” March 22, 2011. 68 The Daily Mail (U.K.), “MPs rebel over Libya mission creep as Cameron, Obama and Sarkozy promise to keep bombing until Gaddafi regime is gone,” April 15, 2011. 69 U.S. Senate Armed Services Committee, U.S. European Command, Op. cit. 72 Hürriyet Daily News and Economic Review, “EU deploys to Libya despite UN concern as rebels welcome US drones,” April 22, 2011. 73 Der Spiegel, “Change of Course? Berlin Open to Humanitarian Involvement in Libya,” April 8, 2011. 74 For example the statements made by General Yunis have been used to push for increased military escalation by Senator McCain at the U.S. Senate Arms Services Committee. 75 Al Jazeera, “Libyan rebels ‘disappointed’ by NATO, April 5, 2011. 76 Borzou Daragahi, David S. Cloud, and Ned Parker, “Rebel leader in Libya demands more of NATO,” The Los Angeles Times, April 5, 2011.